Patrick Vieira's second-half strike sent Arsenal back to the top of the Premiership as the Gunners forced a hard-fought win over Uefa Cup hopefuls Everton. Vieira powered home a crucial 64th-minute effort to seal a vital victory after teenage striker Wayne Rooney had once again threatened to dent the Gunners' title tilt. And while Arsene Wenger's side did not exactly answer all their recent critics with this victory, it was the player with the biggest question mark over his head who wore the broadest smile. Central defender Pascal Cygan has been widely censured this season but chose the perfect time to register his first goal for Arsenal. Eight minutes into his 26th appearance for the Gunners, Cygan stole ahead of a static Everton defence to power a header beyond Richard Wright from Thierry Henry's wickedly delivered corner. 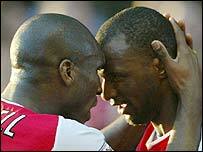 One of Arsenal's least heralded Frenchman, Cygan's near-post header was as powerful as the statement it carried. The early boost signalled an impressive start by an Arsenal side desperate to reclaim top spot from Manchester United. Conversely, it was something of a shaky return to Highbury for Everton's former Gunners keeper Richard Wright. Having been conspicuous by his absence for the opening goal, Wright then spilled a routine Dennis Bergkamp shot into the path of Henry and was grateful to Alan Stubbs for his timely block. The always lively Henry went close with a fierce volley after flicking the ball up to create his own opportunity and when Wright saved from the same player following Arsenal's most fluent move of the half Everton seemed to be chasing shadows. But David Moyes' men, who memorably beat the champions at Goodison Park earlier in the season, slowly found their feet. Their matchwinner in that 2-1 October victory was teenage striker Rooney, who was handed his first away start in a Premiership match for the Highbury return. Rooney was reduced to cameo appearances in a frustrating first half, but that was nearly enough to conjure an equaliser when his excellent work down the right produced a cross that Mark Pembridge only narrowly failed to convert. Early in the second half, Rooney set up strike partner Kevin Campbell for a shot into the side netting, but the young striker finally took matters into his own hands on 56 minutes. Picking up a pass from Campbell, Rooney ran ominously at the Arsenal defence and, as Cygan backed off, cracked a low shot between the defender's legs and beyond Stuart Taylor into the far corner of the Arsenal net. But parity lasted only eight minutes as Arsenal were quick to wrestle back the advantage. Everton were furious that David Unsworth was not awarded a free-kick as he tangled with Bergkamp but Gunners captain Vieira ignored the appeals to slam home the decisive goal. Arsenal: Taylor, Lauren, Campbell, Cygan, van Bronckhorst, Ljungberg, Silva, Vieira, Pires (Parlour 68), Bergkamp (Toure 86), Henry. Subs not used: Jeffers, Wiltord, Warmuz. 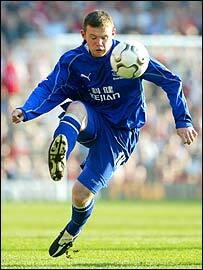 Everton: Wright, Yobo, Stubbs, Weir, Unsworth, Watson (Ferguson 79), Pembridge, Li Tie (Gemmill 73), Gravesen, Rooney, Campbell. "We can't afford any mistakes at this stage"
"I'm disappointed we didn't pull it off"